The original is at Gilad Atzmon’s blog here or on the VT site here. 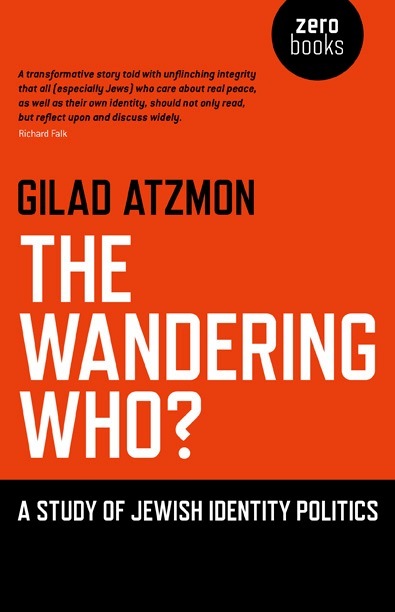 Gilad Atzmon, scholar, prolific writer and leading jazz saxophonist has authored the book The Wandering WHO? In it he astutely explores the identity crisis he himself experienced and one faced by many Jews. Gilad struggled with the conflict between his early experiences as an Israeli Zionist and his awakening as a humanist. His book reveals an innate ability to switch between the qualities of a down-to-earth artist (the successful sax player and word-smith) and the knowledgeable philosopher. Without doubt, The Wandering WHO? will awaken many readers– pleasing some and disturbing others. The pleased will include those who have experienced similar awakenings or resolved identity crises by continuously asking questions. The book will also find welcome readers among those who have sought honest answers to the many contentious issues involving Jewish identity, Jewish politics and Israel. The Wandering WHO? navigates between thought-provoking personal experiences, historical and philosophical issues. In the forward, Gilad tells the most remarkable story of his Jewish upbringing and the challenging questions raised by his early experiences as an Israeli Zionist. 1. Those who follow Judaism. 2. Those who regard themselves as human beings that happen to be of Jewish origin. 3. Those who put their Jewish-ness over and above all their other traits. “Jews are often proud to define themselves as Jews. However, they will also be gravely offended if they are called a ‘Jew’ by others. “It is not the idea of being unethical that torments Israelis and their supporters, but the idea of being ‘caught out’ as such. “The more they (Israelis) insist on loving themselves for who they think they are, the more they loathe themselves for what they have become. “Otto Weininger helped me grasp who I am, or rather who I may be, what I do, what I try to achieve and why my detractors invest so much effort trying to stop me. “Thanks to Weininger, I realised how wrong I was – I was not detached from the reality about which I wrote, and I never shall be. I am not looking at the Jews, or at Jewish identity, I am not looking at Israelis. I am actually looking in the mirror. With contempt, I am actually elaborating on the Jew in me. “…the bitterest anti-Semites are to be found amongst the Jews themselves. “Jewish lobbies in the USA and Britain openly advocate for the extension of the ‘War Against Terror’ against Iran, Islam and beyond. I would never claim that this type of warmongering is inherent to Jews as a people, yet, unfortunately, it is rather symptomatic of Jewish political thinking – left, right and centre. “A Judeo-centric political exercise, namely self-determination, which comes at the expense of others. “From Karl Marx through Leon Trotsky to Herbert Marcuse, a sizable fraction of the revolutionary anti-capitalist literature has been authored by Jews. “As a young man, I myself took part in some Jewish righteous parades, ready to grab my sword and join the hunt for a Tsar, a capitalist or any other enemy who might cross my way. But then the inevitable happened: I grew up. “Robbery and hatred is imbued in Jewish modern political ideology on both the left and the right. “‘The Israeli’ robs in the name of ‘home-coming’, the progressive Jew in the name of ‘Marx’, and the moral interventionist murders in the name of ‘democracy’. “Pre-Traumatic Stress Syndrome (Pre-TSS) is a fundamental tenet of Jewish and Israeli culture. “The people who rained Lebanon in 2006 with more than a million cluster bombs and showered Gaza with white phosphorus (2008-9) are projecting their homicidal zeal onto their victims, and even onto their future victims. “The more hopeless and defenceless the Palestinians are, the more vicious the Israeli becomes. And yet, the more vicious the Israeli is, the more he or she is horrified by ‘terror’. In reality, the Israelis are actually horrified by their own cruelty. “The ‘Jewish people’ is a made-up notion, consisting of an imaginary past with very little to back it up forensically, historically or textually. “Nor has much been found in the Sinai Desert to prove the story of the legendary Egyptian exodus – apparently 3 million Hebrew men, women and children marched there for forty years without leaving a single Matzo Ball behind. “Jews do not have a common origin, that their Semitic origins are a myth. Jews have no origin in Palestine whatsoever, and therefore their act of so-called ‘return’ must be realised as pretext for a tribal expansionist invasion. “If Shlomo Sand is correct, then the Jews, rather than being a race, comprise a collective of many people who have been hijacked by a national movement based on myths. “If Jews are not a race and have nothing to do with Semitism, then ‘anti-Semitism’ is, categorically, an empty signifier. In other words, criticism of Jewish nationalism, Jewish lobbying and Jewish power can only be realised as a legitimate critique of ideology, politics and practice. “Professor Yeshayahu Leibowitz, a Latvian-born philosopher at the Hebrew University, was probably first to suggest that the Holocaust has become the new Jewish religion. “This new religion is coherent enough to define its ‘antichrists’ (Holocaust deniers), and powerful enough to persecute them (through Holocaust denial and hate-speech laws). “The Holocaust religion serves both right and left Jewish political discourse, but it appeals to the goyim as well, especially those who preach and advocate killing in the name of ‘freedom’, democracy and ‘moral interventionism’. “That which maintains the Jewish collective identity is fear. “To a certain extent, the Holocaust religion signals the final Jewish departure from monotheism, for every Jew is potentially a little God or Goddess. Abe Foxman is the God of anti-defamation, Alan Greenspan the God of ‘good economy’, Milton Friedman is the God of ‘free markets’, Lord (Peter) Goldsmith the God of the ‘green light’, Lord (Michael) Levy the God of fundraising, Paul Wolfowitz the God of US ‘moral interventionism’. AIPAC (the American–Israel Public Affairs Committee) is the American Olympus, where mortals elected in the US come to beg for mercy, forgiveness for being Goyim and for a bit of cash. “To be a Jew is to see a threat in every Goy, to be on a constant alert. “…whatever is good for the Jews is simply good. “The Jewish population in the UK is 280,000 or 0.46 per cent. There are 650 seats in the House of Commons so, as a proportion, Jewish entitlement is only three seats. With 24 seats Jews are eight times over-represented. Which means, of course, that other groups must be under-represented, including Muslims. If Muslims, for instance, were over-represented to the same extent as the Jews (i.e. eight times) they’d have 200 seats. All hell would break loose. “Jewish history engages with the basic question of whether a given account is ‘good for the Jews’ or not. “The dismissal of factuality or lack of commitment to truthfulness are actually symptomatic of contemporary Jewish collective ideology and identity politic. “In the Jewish intellectual insular world, one first decides what the historic moral is, then one invents ‘a past’ to fit. “As long as we fail to ask questions, we will be subjected to Zionist lobbies and their plots. We will continue killing in the name of Jewish suffering. We will maintain our complicity in Western imperialist crimes. “With millions of besieged Palestinians, Israel has given itself the reputation of a pariah state. “How is it that, in spite of the Holocaust, Israel and Jewish lobbies invest so much energy in evoking hatred towards enemies of Israel and world Jewry? “…envisage an horrific situation in which an Israeli so-called ‘pre-emptive’ nuclear attack on Iran escalates into a disastrous nuclear war, in which tens of millions of people perish. “I asked the emotional tour guide if she could explain the fact that so many Europeans loathed the Jews so much and in so many places at once. I was thrown out of school for a week. The Wandering WHO? provides a rare perspective on Jewishness, Judaism, Jewish politics, Zionism, identity crises, self-hate and self-love. Posted on 2011-09-06 16:36:54 GMT+0000 by Neil Godfrey. This entry was posted in Ethics & Human Nature, Israel-Palestine and tagged Antisemitism, Gilad Atzmon, Holocaust, Israel, Jews, Zionism. Bookmark the permalink. Well! So if I am a socialist I’m motivated by robbery and hatred. And am probably Jewish. No I’m motivated by knowing what poverty is, all the many ways it affects people and knowing that a better world is possible. Of course anti=semitism exists, as does Islamophobia, anti black racism, anti Irish and so on – all based on lies or pseudo-science. That race is a myth does not mean racism is. As a very active worker for Palestine solidarity I thank God that I have many good Jewish comrades acting with me, along with liberals, socialists, christians and Muslims. I love them all. Just as the Jewish workers of (many of them Communists too) did not separate their fight against the Blackshirts in the East End from their standing with Republican Spain, so those fighting racism in Britain today do not separate the struggle in Britain (preeminently now against Islamophobia) from their opposition to the racism of the colonial Apartheid state of Israel. I din’t want my Jewish friends to waste their time worrying about what it is to be a Jew. There is no Jewish essence – least of all an Eternal Jew based on 19th century Austrian petty beourgeois pseudo science. Gilad is not denying anti-semitism exists but is addressing theoretical constructs: Given that there is no ‘biological race’ of Jews and Jews are thus a social construct the ‘anti-racism’ that is mounted against them must fall into a category of being opposed to what Jewish representatives are in fact doing, not against what they are racially. But I make it more complex by trying to explain it! Well it’s not some scholars but most scholars. Zionism described itself as a colonial movement. Its first bank was the Jewish Colonial Trust. Colonialism was at the time something which was thoroughly approved of by the capitalists that Atzmon defers to. Settling someone else’s land and driving them off it were not unique to Jewish ‘tribal solidarity’ but pretty much the staple fare of colonialism. In Palestine the British established the normal machinery of colonial rule, a High Commissioner etc. and the responsibility for the Mandate was that of the Colonial Office. As was the case with all settler colonies. And if Zionism is the product of the genetic make-up/unique tribal solidarity of Jews, how come they didn’t make the journey in 1200 or 1500? Why during the 19th and 20th centuries, the age of colonisation? We are unlikely to find many clues here because for Atzmon it is ‘Jewishness’ that explains all, except that so-called Jewishness is entirely subjective and subject to individual whim. It has no more basis in fact than the racial theories of Hans Gunther or Himmler. And if Israel is not a colonial outpost, the regional gendarme of the USA, but a product of world Jewry, then the battle is or should be fought against Jews outside Israel not Israel itself, which is after all only their pawn. The absurdity of Atzmon’s thesis is self-evident. He doesn’t like what Israel has done to the Palestinians but offers no solution other than racial conflict, because whether he likes it or not, his definition of Jews is a racial one. And because he holds that Jews have certain inherent characteristics, he reserves most of his criticism for anti-Zionist Jews. David Hillman has dealt with the argument that because Jews are not a race one cannot be racist or anti-Semitic towards them. By this analysis the Nazis also were not anti-Semitic, hence Atzmon’s holocaust denial views and utterances. Problem is that there are no races. Race is a political construct. Therefore there is no racism. It does not exist. This book is a testament to Atzmon’s ego but explains nothing. The fact that Zionism began to strengthen in the early 20th century would seem to indicate it was a “concept” fostered by a radically religious few but rejected by many. The few obviously saw value in their concept and manipulated society to make being a Jew in any other society “uncomfortable”, and sufficiently so as to cause more of the many to immigrate to Palestine. What did or do the radical Zionists actually get out of Zionism? Is it money, power, emotional satisfaction . . . what? Jews seem to be ultimately controlled by their religion rather than by what they really know is right. Which of course has led to many governments not allowing Jews to hold high-ranking positions. Jews generally are considered by many to be unwitting “sleeper-cells” waiting for the order from some higher authority than the government of their host nation, to act, against that nation. Which is why Germany segregated the Jews from the general populace (International Jewry did publicly proclaim that they’d work against Germany from within in the interests of Britain and her allies) and why America did the same to Japanese-Americans. No country can conduct a war with fifth-columnists on the loose in the country . . .
Israel is run by Zionists to a Zionist doctrine who want to colonize all of Palestine and exclude and eliminate any non-Jew. Naturally their neighbors are wary of Israel’s future intent regarding their countries. That in itself should be sufficient reason to warrant serious restrictions and sanctions agains tIsrael’s expansion. I find your comment most disturbing. I am a Jew, too, in the sense that I am just as human as anyone who is called a Jew. We are all one humanity. “Jews” are no more “ulitmately controlled by their religion rather than by what they really know is right” than anyone else is. That is an incredible claim: do you really believe there is a whole race of people who knowingly act against what they know is right? Do you really find it incomprehensible that Zionists are motivated any differently from any other sentiment common to us all? Zionism is an imperialistic-racist relic of the nineteenth century that infected the bulk of Europeans and Americans at the time. But I was wrong in my earlier comment when I went along with a comment that associated Zionism with colonialism. There is nothing colonial about the Zionist enterprise at all. It is a re-play of the cleansing of the north American and Australian continents of the “savages” who were deemed a threat to civilization then. It is a replay of what “we” (non-Jews) have “ourselves” done. There are many Jews who have always opposed Zionism and many heroically do so even within their own state of Israel. Does Gilad Atzmon really argue that “Zionism is the product of the genetic make-up . . . of Jews”? You actually write “genetic make-up/unique tribal solidarity of Jews” as if they are synonymous. Does Atzmon argue that “tribal solidarity” is “genetic”? If I had ever suspected as much I would never have publicized his works. You write of nineteenth century “colonialism” as if it were a sanitized word — a neutral tool. Pity it was the tool and channel of racism and in too many cases genocide. Zionism was born in an age of racism and imperialist ambitions and has continued to perpetuate that mentality long past its use-by date (which was really around 1914 but with a definite closure in the 1940s). David Hillmann appeared to misunderstand the nature of an argument about theoretical constructs as opposed to the literal realities and you appear confuse the two concepts in your last paragraph, too. As the poet Allen Ginsberg said, “If you want to be a prophet, you have to tell your secrets.” By being brave enough to expose himself in writing, Atzmon has become a prophet, and his prophecy, as I see it, is a completion of the Mosaic journey, but this time as a mass exodus from Jewishness and all other ethnic bondings that split humanity. After 40 centuries of wandering in the desert of chosenness and separation, Jews and Gentiles alike can finally enter the full humanness of one world family, a secular promised land free of divisive group identities. Gilad Atzmon has some interesting opinions, but some I’d have to question. For his comments about Israel’s treatment of Palestinians…are there comments showing the contrast that exists with Arab, Druze and Bedouin populations in Israel proper? That the non-Jews who remained with Israel after 1948 were made full citizens with full rights? Has he noted that it’s still the one country in the Middle East that is safe for Christians? Atzmon has his right to an opinion…but that’s all it is, an opinion. I can’t treat it as fact. Perhaps someone should remind him how things would be for him personally if he were living in other parts of the Middle East where they don’t treat Jews or Christians well. Imagine him writing similar things against, say, the Egyptian state, the Libyan state (under Gaddafi or the new regime) or even against Saudi Arabia. The fact he did live in a democracy is the reason he can express his opinion. He doesn’t get tortured or executed for it as he would be elsewhere in the region. I have nothing against Jewish introspection and self-analysis. Heck, even the rabbinical process involves FRIENDLY debate of two different interpretations of the same piece of Torah. But I think he should stop trying to overdo trying to fit in with others that he becomes self-hating. Neil, I read back up a few more comments and saw what you had to say on Zionism. I may agree the Midnight Oil song “Beds are Burning” is appropriate to the Australian context. It has a resonance (not sure if that’s the appropriate word) with how Europeans have treated Aboriginals. However…I cannot see it as having a resonance with the situation in Israel with the Palestinians. You’re confusing Palestinians with an indigenous culture and I happen to know of a Canadian Indian who cannot relate to Palestinians as indigenous to the Holy Land. He cannot relate to Palestinians trying to compare their case to his. He is insulted by what the Palestinians try claim. Perhaps if we go back to the 1920s and look to the fact Arabs in the Holy Land wanted to call themselves “Southern Syrians.” In other words, they wanted to be part of Syria and its ambitions, rather than be “indigenous” to the Holy Land. How many writers and historians who visited the Holy Land right up to the 19th century pointed out how sparsely inhabited it was? Enough. One of them being Mark Twain, but a couple were even from Muslim backgrounds, all pointing out that by the 19th century, there weren’t that many Jews or Arab people remaining in the place. But there were Jews and ones whose families had been there since Hadrian. Living in really harsh conditions. And watching Romans, Byzantines, classical Muslims and Arabs, European crusaders and then later the Turks walk through the place. The archaeology of the place constantly bleeds Jewish ancient history, with smatterings of the imperial blow-ins. Imperial in that representatives of one empire or another kept wandering in and out. Even the Turks. The situation changed as more Jews returned and legally bought back their homeland. Then came waves of Arabs seeking work, AFTER that. Easy to tell simply by family names who was from that patch of turf and who wasn’t. IF you ever meet a “Palestinian” whose family name is Halaby, he’s from Syria. Family names over there also tell the origin points. And if we want to talk about colonialism…since the Arab homeland IS what we now call Saudi Arabia…there ARE peoples who have been in each Middle Eastern country longer than the Arabs who have to see their countries occupied by the Arabs. Which makes the Palestinian claim of Israel occupying quite hypocritical. Jews just want to live in the only place their holy sites are…where their ancient history is. Saudi Arabia wants to do that too and haven’t ever been expelled from their land…but they also romp through a heap of Middle Eastern countries they originally weren’t the indigenous people of. I’ve tried putting this as politely as I could. But I cannot see Zionism as colonialism without pointing out Arabia may be more guiltier of it than Israel. Anti-Semitism goes back heaps further than the 19th century, it goes further back than the Bar Kockba revolt or even the destruction of the temple. It goes right back to Egypt and before the Exodus. Ironically, recently I read Egypt is going to try suing the Jews/Israel for the gold and wealth that went out of Egypt with the Israelites in the Exodus. I’m not sure whether to think that hilarious. Since their “proof” for such a claim rests on a biblical story…the same biblical story that tells of the Egyptians enslaving a people who originally came in as guests. So if Egypt wants to use that story, we have to factor in it’s cruel to treat guests that way and there’s bound to be some compensation for wages by the descendants of the Israelites. If you are interested in what I have written about a Palestinian view of their history you might like to look at a series I have yet to complete — three posts done so far. What I think is interesting is how one claim is deemed so sensible and right while the other is considered inanely ludicrous. Hector Avalos would, I think, if I understand his argument in Fighting Words correctly, attribute a good deal of this dichotomy of views to the nature of the religious beliefs that are at their (and our) respective roots. Here’s one thing that’s interesting about the Palestinian view of history…they can’t tell us anything about an independent state of Palestine because no such state ever existed under any of the empires. It was only ever an administrative district even under the Byzantines, under the earliest Classical Islamic empires. One Crusader Kingdom as the only sovereign state in the Middle Ages. Finally four hundred years of Turkish empire, still a backwater, still an administrative district…still with a population of Jews going back to Hadrian’s time. Yassir Arafat…Egyptian. So how can we take Palestinian history seriously? And that’s the truly ludicrous claim. The amount of truly Palestinian Arabs is small…the rest are Egyptian, Syrian, god-knows-where-else-in-the-Middle-East. Such a history has to be invented…whereas at least the Jewish and Israelite history has the benefit of independent verification…and archaeology. Even with a section of their people doing wandering through the world…Jews would still be indigenous in a way the Arab Palestinians would not. After all…Arabs are indigenous to Arabia…and Jews are indigenous to a place mistakenly called the West Bank that’s actually long been known as Judea (or Jew-dea if you break it into syllables). There’s another point of view to this: The Invention of Ancient Israel: the silencing of Palestinian history by Keith Whitelam. Might I point out that the Palestinians do enough of silencing history in places in the West Bank that once had long standing Jewish sites? And while we’re at it…even Christian history. Would you like to tell me how many Christians are in Bethelehem since Palestinian Authority control? Ancient Israel isn’t an invention. It’s attested to even by enemies of the Israelites/Jews…which if I remember is called hostile witness testimony. I was reading earlier today of archaeology elsewhere that still attests to the House of Omri (northern Kingdom). Independent records, independent archaeology…doesn’t bear out Palestinian history as anything more than very recent. Actually, let’s explore this indigenous bit further. Are the Turks indigenous to Turkey? No. That’s just where they finally settled. Are the English indigenous to Great Britain? No, they’re Angles and Saxons from Europe. England is just where they settled. Americans? Indigenous originally to England before coming to the Americas, refer to Angles. Need I go on? Neil, I did read the Freerepublic article and after this I’ll be looking at your three articles. It’s NOT like the idea hasn’t been tried before. Heck, it’s old…ancient. And countered the same as the last time it was tried. The Egyptians still enslaved a people. Wrongly. Those enslaved would have a stronger compensation case. The rest of it? Is ludicrous. Just goes to show Egypt didn’t learn anything from 10 plagues from a righteous judge. That judge found in favor of the slaves. And compensated them with the equivalent of wages for the time the Egyptians had them in slavery. Perhaps Israel should charge Egypt interest for repeated attempts to re-enslave Israelites/Israelis. I came in late, so I’m still catching up. Are you joking? I did write that semi-satirically…but it sort of fits as the Egyptian case is based off the Hebrew bible story…so we might as well go all the way with it and use the same evidence they want to use to sue the Jews with. The Egyptians don’t want to admit that their enslavement of the Israelites itself was wrong.